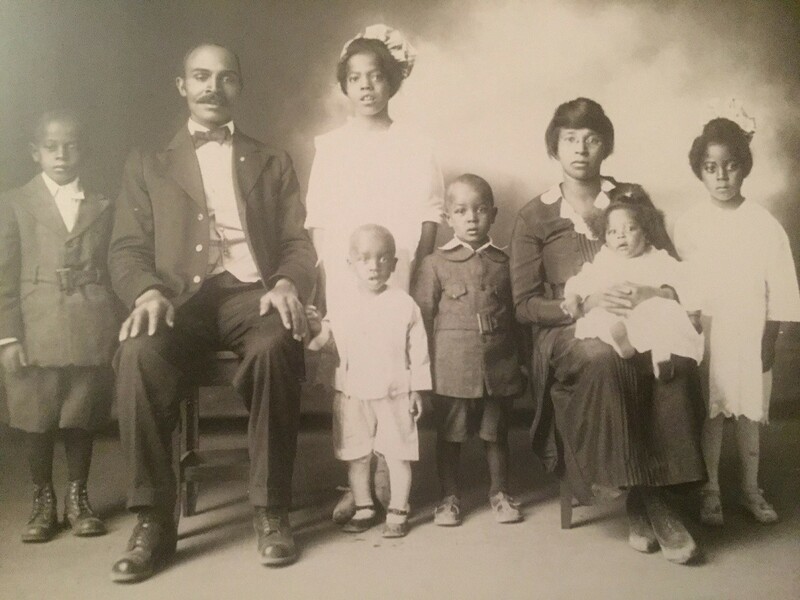 From left, (seated), Benjamin Franklin Fermon, and his wife, (seated), Jessie Amy Anderson Fermon, and six of their children. Rock Springs, Wyoming, circa mid-1920s. Spoiler Alert: Were they alive today, my Republican grandparents, pictured above, would eat the lunch of the current GOP Presidential Nominee. The presidential election of 2016 has exposed a strain of racism and flat-out ignorance among some residents of the United States that is to me upsetting and discouraging. The GOP Presidential Nominee, a business-man with no prior record of public service or elected office roles, recently has been imploring African-Americans to support his candidacy. Yes, I am deliberately not mentioning here the candidate’s legal name. This is a strategic choice made with an eye toward posterity. If you’ve ever stumbled across my posts in Twitter or Facebook, you might have noticed this omission. My rationale is simple, if Quixotic: When the tides of time wash forward and my digital residue sloshes up on a distant shore, I do not want my name attached to this individual. Call it a quirk, an affectation or a distinction, that’s fine. I’m not terribly worried about external approval on this. What Have We Got to Lose? Is This a Trick Question? As Presidential Election Day 2016 looms, I’m compelled to say that the GOP Presidential Nominee is unfit to serve as our Commander in Chief. You’ve likely read this opinion elsewhere, so I won’t recap here. His cynical, and frankly, DUMB messaging, currently being kinda-sorta directed at African-Americans in suburban rallies around the nation, infuriates me. I am pretty upset that in 2016, the GOP Presidential Nominee is portraying “the African-Americans” as if we all are A) a single entity, and B) all broke down, hopeless, helpless, and desperate enough to throw intellect and caution to the wind and vote for him — a white man of European descent who has benefited from family wealth, male privilege, and the unfortunate recent diminished state of both our collective attention spans, and of the American news business. I’m not into what the youngsters call ‘respectability politics,’ nor much taken by the typical Status Markers that have characterized black and white polite society for generations. It matters to me that our elected officials are intelligent, kind, ethical and curious. The GOP Presidential Nominee is none of these. I like being American. I know that hard work, and common sense practices of fair play are actually (in short-hand), founding principles of our nation. Oh, of course I’m mindful too of the many large, obvious and long-lasting contradictions, including slavery, the decimation of millions of native people, the plundering of our continent’s natural resources for individual enrichment. But, as President Obama is wont to point out, we have genuinely come a long, long way toward achieving a version of equanimity that was unthinkable to our ancestors. The prospect of sloughing back even 50 years in time is not an option. And paradoxically to someone like me, a liberal black woman, there actually are useful signposts to be found in our not-too-distant past that allow us to see the spectacular absurdity of the present GOP Presidential Nominee. The photo atop this post is one of them. It shows my maternal grandparents, Benjamin Franklin Fermon and Jessie Amy Anderson Fermon. Ben was born in Platte County, Missouri in 1877, and Jessie, ten years later, in Iowa. Ben fled Missouri in the late 1890s, striking out for the West, too smart to stick around during the racist terrorism that was going on in Mizzou during that moment. Over the next four decades, Ben was busy: He worked in the Anaconda Copper Mines in Montana. He toiled in coal mines in Colorado and Utah before settling down in Rock Springs, Wyoming, where he became a community leader. He worked in Rock Springs for the Union Pacific Railroad and Mining Company, and bought property outside of the ‘company town’ that squatted over several miles on the rocky high desert landscape. Alongside his full-time work in the coal mines, he ran a cattle ranch with his sons. He named it The Lazy F Ranch — a corny joke, given that he was rarely idle. Meanwhile my paternal family members, the Alexanders of Tennessee, were similarly hard-working in their Deep South region. Owing to the vicissitudes of life, including family relationships, it is my maternal family history that I’m invoking here as stark rebuke to the GOP Presidential Nominee: Their story is not only classically American, it is of a singular strand that is so often pimped by national political candidates of all party affiliations: characterized by integrity, entrepreneurship, overcoming of big odds to forge a path. My maternal grand-parents embodied the Manifest Destiny story so beloved by American traditionalists, in particular by conservative Republicans. I daresay Ben Franklin Fermon would have slid his thumbs along his suspenders, hitched his pants up slightly, and watched a man like the current GOP Presidential candidate, very, very closely. 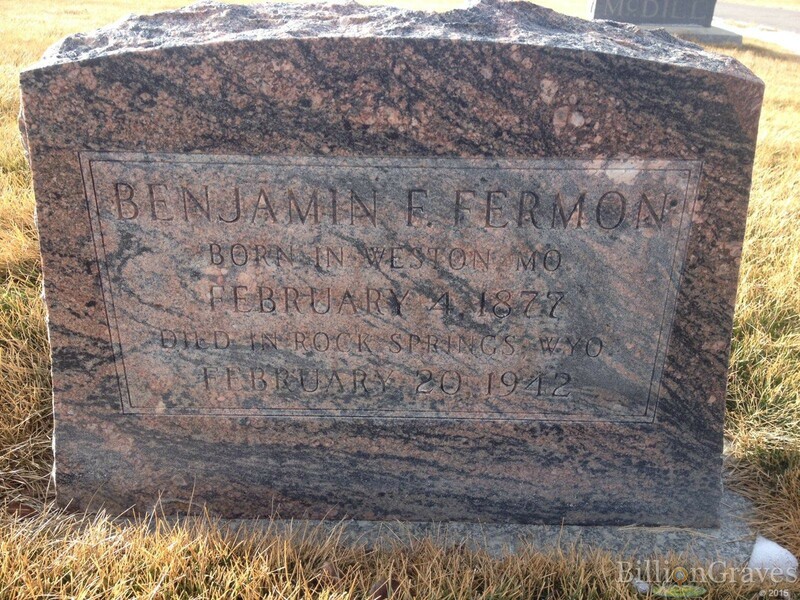 The gravestone of my maternal grandfather, Ben Franklin Fermon, at Mountain View Cemetary, Rock Springs, Wyoming (credit: BillionGraves.com). I keep a fading photocopy of the obit section in the Rock Springs Rocket Miner newspaper from 1942. The clipping is Ben’s obituary — he died of black lung following more than 25 years working in coal and copper mines in the West. Before he died, he let his sons and daughters know that they shouldn’t hesitate to pull up stakes and head out for new environments, and different, more modern jobs: World War II was spawning amazing new industrial growth, and two of Ben’s eldest children had already taken up residence and work in Northern California. When I hear the current GOP Presidential Nominee banging on about how he intends to ‘bring back coal mining jobs,” and when I hear his cynical, dumb, and ham-fisted ‘pitch’ to African-Americans to support him because well, what have you got to lose…..My stomach turns. I’m not going to outline here the full trajectories of Ben Franklin Fermon’s offspring, siblings and other kin, beyond saying that I am extremely grateful for the grit, smarts, and moral grounding of them all. It is out of respect and honor for them that I am here disclosing my my deep aversion to this 70 year-old white guy, the GOP Presidential Nominee. He’s 15 years younger than my Mom, who was born in 1931, and spent her formative years amid a multi-ethnic community of workers from the mines who lived in Rock Springs during that era — families and kids from Poland, Italy, Germany, and the American Deep South. Together they chased tumble weeds, shoveled snow, waded through creeks, and learned to cuss in several languages. By contrast the GOP Presidential Nominee is a Richie Rich who is obviously unaccustomed to experiencing any serious major obstacles in his life. He is far more dumb than any of my people, although he’s had unlimited opportunities to learn: in my grandfather’s time, few of his cohorts attended school beyond 6th grade. Also, as I read him, the GOP Presidential Nominee is shockingly immature. Granted, I’ve never met or inter-acted with the GOP Presidential Nominee, but I have read volumes by now about his early life, and his recent past, in addition to observing him closely during the Umpteen hours of free earned media he’s scored in the past 12 months. It is clear that he is someone who has never performed any grinding physical work, nor inter-acted with working-class Americans in a manner that inspired in him either intellectual or empathetic (emotional) insight. I wonder if he has read and absorbed American history? Does he know that there are families like mine out here? The fact that he is apparently expecting masses of African-American or even politically moderate white voters to fall for this latest sales pitch would be hilarious — were it not so horribly, perversely insulting. My grandfather Ben was a Republican, but he wasn’t stupid. Millions of my cohorts nationwide have similar family histories to share, riveting stories I am sure of grand or great-grand parents who were proudly Republican. My peers also have stories of how their family over generations abandoned the Party of Lincoln thanks to the infamous Southern Strategy that was hatched by Richard Nixon, and which expanded, morphed, and twisted beyond all recognition into what it is today. As the young people are fond of saying lately, Oh, we’ve got receipts. They’ll be in our pockets when we take to the polls on November 8, 2016.